There is still a lot of food to enjoy without experiencing any symptoms of fructose malabsorption. Once you know a proper fructose malabsorption food list, you can improve your well-being significantly. 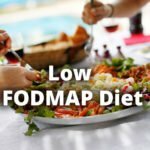 I will show you what is favorable to eat and what you should avoid for eliminating symptoms and restoring normal digestion. The following food list is specific for fructose malabsorption. It differs from the low FODMAP food list, as you don’t need to avoid all FODMAPs, such as lactose, when having only fructose malabsorption. Herbs often contain high amounts of fructose. But as only small amounts are typically used for cooking, they should not invoke any symptoms. This was only an excerpt of a much larger list. Read on to see the rest. For even more detailed information, download my free nutrition guide. And if you want to have an infographic of the fructose malabsorption food list for printing and pinning somewhere, see further below. But first, some additional tips for sweetening your food and how to balance your fructose intake. If you like sweet stuff from time to time, I can give you some good news: You do not have to pursue total abstinence. You may use sucrose in small amounts, as it consists equally of glucose and fructose, but you will feel better by choosing safe alternatives. These alternative are for example Stevia or dextrose. Do not use honey or sweeteners like sorbitol to sweeten your food as they will worsen your symptoms. You can find more information on the Sweetener page. Check out the table and the figure there for a large list of favorable sweeteners and sweeteners to avoid. As I mentioned on the Fructose Malabsorption Diet page, you should avoid fructose entirely only in the first phase of the low fructose diet. Avoiding it further could worsen your symptoms in the long run. So keep trying, add some fructose to your meals, e.g. low fructose fruits like bananas, and slowly find your dose. This will vary over time and may probably increase by doing the low fructose diet. For me, it worked out really well! Did you miss something? Leave a comment and I will do some research! You are welcome. I’m pleased to hear … or read that! Hi! This is very helpful but I am having trouble printing the infographic. .